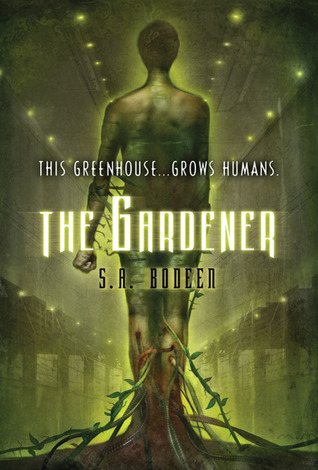 The first thing that caught my attention about this book was the tagline on the cover, 'This Greenhouse...Grows Humans'. After reading that line the first thought that popped into my head was what in the world, which was immediately followed with me grabbing the book off the shelf to take it home and read. 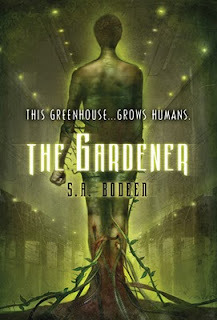 I really wasn't sure want to expect when I started The Gardener, I've never read a book by S.A. Bodeen before and I've never even heard of a book about plant people! This book is definitely like nothing I ever read before and made me think about the future of our planet. The main character, Mason, was attacked by a dog when he was younger which left most of his face covered in scars. He lives with his single mother and keeps pretty much to himself at school. Because of his large size he is able to intimidate bullies so he likes to think of himself as kind of a super hero in his town. You would think that always wanting to help people is a good thing, but when Mason wakes up a supposedly brain dead girl that seems to have a secret troubled past he just can't walk away. To me, this book wasn't really character driven, but more theme driven. I thought the main point that the author was trying to make was that a lot of the actions our governments are making today aren't thought about as how they would affect future generations. The decisions we all make are only made for our current time period, not even thinking about how it will affect our grandchildren or even ourselves down the road. The Gardener brought a lot of new ideas to my mind about how we aren't doing our best to preserve the earth. I really enjoyed the almost controversial view that our government doesn't really have our best interest in mind. They're so focused on the now that they don't even think about fifty or even five years down the road. Honestly, I wasn't a fan of the ending in the slightest. I'm not fond of endings that leave so many questions unanswered that the impact of the book is slightly ruined because I find myself going 'wait, what about...' I thought that after the climax of the story occurred that the falling action was so scarce that I almost felt it was forgotten. I never really considered myself very 'green' when it comes to saving our planet, but this book definitely got my mind working in that direction. The Gardener left me speechless when I was brought to the conclusion that we are all acting pretty selfish by not preserving the earth for future generations. This book made me realize that we all could be doing so much more. S.A. Bodeen's writing left me questioning my own actions and the governments. When I finished the book I was left with a growing appreciation of our ancestors and the planet we call home. I haven't visited your blog since you changed your banner (could have been quite a while!) and just wanted to say that I love it! This book sounds interesting. If I just heard the title I wouldn't be interested, but the cover is pretty cool - not to mention that tagline! Good review - The cover seems a bit creepy to me though.